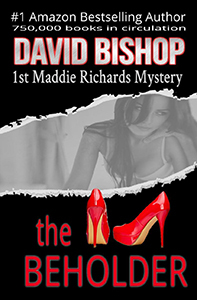 The novels of the Maddie Richards Mystery Series have appeared many times on the Amazon Bestselling lists. Maddie Richards is an efficient and resourceful detective with a secret wish that she could handle her messy personal life as well as she handles her work life. As a homicide sergeant for the Phoenix, Arizona, Police Department she has one of the highest solve rates in America. Her success leads the chief of police to assign her a serial killer case. Some sicko the press calls The Beholder is killing beautiful women. Her chief describes the case as “as career maker or breaker, get me?”. Maddie started eating Reese’s Pieces, “I’d rather snack on a man, but they don’t come in a bag you can pop in your purse for later. The night chill climbed her cheeks to draw the moisture from her eyes. Dink came toward me sucking on a straw stuck into a soda cup the size of a desert canteen. I recognized him from his white socks and toe-out stride developed through a lifetime of being pudgy plus. 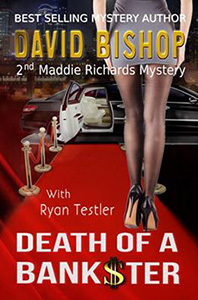 Maddie Richards finds herself in the middle of a case which starts with the sights and sounds of just another murder investigation. A woman claims her husband, a banker, was murdered. Later, Maddie learns that the woman had started divorce proceedings the day before she claims a bullet had taken her husband from her. The murder greased her path to not only ending her marriage, but negating any need to divide their marital property. Then the wheels come off and nothing about Maddie’s case is what it seems. Along the path of the case Maddie meets the most fascinating man she has ever encountered. Little did she realize what a major role the man would play in her investigation and the culmination of the case. I will have to watch for this one. I caught a cross-post on Deborah Buell Coonts FB page (I love her Lucky books) and thought I would check out yours. Interesting premise, sounds like there are plenty of twists and turns to make this a real page turner! That there are Vicky. Thanks for the interest. The Beholder will be out in mid-October as both an eBook and in softcover. Please let me know how you like it. Looking forward to reading this! Maddie’s “messy” personal life so mirrors my own, I will have to see how this all pans out. 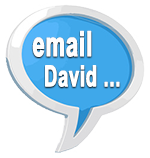 David, do you have a career in law enforcement? I’m tickled pink to have discovered your books. Your style and wit are bright stars in a world of mediocrity. I’m not ashamed to admit that I occasionally have to go to reference while reading you. Sigh! What big brains you have. I can’t put down The Beholder! When will there be more Maddie Richards books. Seeee, build it and they will come. Advertise and you got it made! I like your website, and I see there are still yet MORE books I need to read. What FUN! You now have an avid fan in me. Thanks also for your support to other writers. I truly feel that your success is due in part because you give back. Keep writing!!! Love reading all of his books..his characters are fun and he keeps the story moving! 5 stars! Is there a 3rd Maddie Richards in the pipeline? Please say yes! Ohhhh, you have left me hanging in The Bankster!!!!!!!!!! Are you going to write a sequeal ???? PLEASE SAY YES!!!! I loved this book !! !